Burba Park includes six lakeside locations perfect for family functions or unit/organization picnics. Outdoor pavilion include, tables, benches, grills, horseshoe pits, a softball field and a volleyball court. The cottage location features tables, chairs, and a well-equipped kitchen. 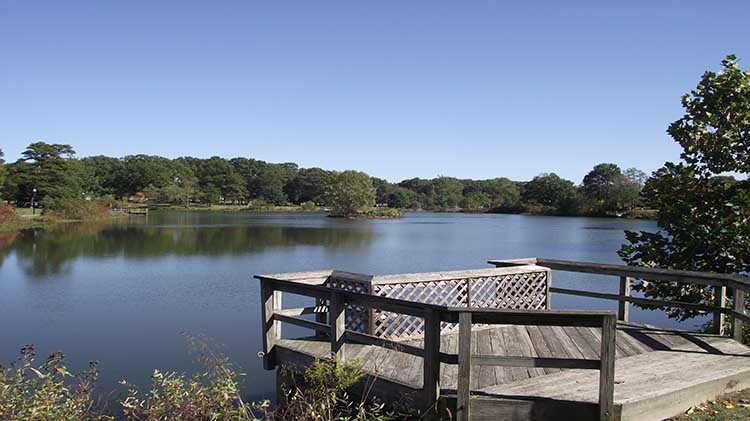 There are three fishing piers and benches located around the lake for your enjoyment. The lake is surrounded with a blacktop walking path. All pavilions come with a charcoal grill, electrical outlets, water fountain, picnic benches/tables. Note: These are self clean facilities. Inspections and checklists will be done before and after usage. Fees will be assessed for deficiencies. Fishing is allowed in Burba lake. Local fishing permit is required for adults. Burba lake is stocked yearly. There is no swimming or boating on the lake. Pavilions and the cottage are for use by eligible persons. Reservations can be made at Building 2300 Wilson Street, +1(301) 677-3810 The possibility of advance reservation depends on the patron's status and the type of function. Softball Set: 2 bats, 3 balls, and 4 bases. Volleyball Set: 1 volleyball and net set up in the area. 1 broom and 1 dustpan. These two pavilions cost $100 each, per day for Active Duty, Reservists, Retired, DOD Civilians, and Registered Private Organizations. Horseshoe set: 4 horseshoes, 2 stakes, and one mallet. These three pavilions cost $80 each, per day for Active Duty, Reservists, Retired, DOD Civilians, and Registered Private Organizations. Horseshoe set: 4 horseshoes and 2 stakes. Use of the facilities is by reservation only and can be made through our office; use of areas is subject to eligibility and availability. * A $200 Cleaning Deposit is required upon reservation. Burba Cottage is availble from Apr. 1 through Dec. 31. Burba Pavilions are available from Apr. 15 through October 15. Arrangements can be made for Thanksgiving Day, Christmas Day, and New Year's Day. Reservations are being accepted for Active Duty, Reserve, Retired Military, and DoD Civilians.